PG&E's looming bankruptcy presents a lot of questions. Here are some initial answers. The move sets the stage for what could be a years-long struggle to restructure the state’s largest utility to improve its safety, keep up with California's clean-energy and carbon-reduction goals, and prepare it for a future in which climate change makes wildfires an increasing threat. PG&E filed a bankruptcy "notice" on Monday, as required by California law. So could the utility change course before officially filing for Chapter 11 on January 29? California leaders’ response to PG&E’s bankruptcy announcement has deflated observers’ hopes that they will step in to prevent it from happening. Rob Rains, energy analyst at Washington Analysis, noted that state Senate President pro Tempore Toni Atkins issued a statement Monday saying that the protection of ratepayers, fire victims and reliability would be some of the legislature’s top priorities in the "coming months," suggesting no push for an immediate response. Newly elected Gov. Gavin Newsom used similar “throughout the months ahead” language in his Monday response to PG&E’s announcement laying out his administration’s plans. During a Monday afternoon press conference, Newsom said that "the consequences of distrust and mistrust" between PG&E and the public would make it difficult to balance the needs of fire victims, ratepayers and shareholders, called for changes at PG&E’s board of directors, and noted that options including breaking up the utility were still on the table. Indeed, PG&E’s bankruptcy notice seems to have put a halt on legislative action to help the company. In November, Assemblyman Chris Holden launched a legislative effort to amend the bill to extend SB 901’s bond coverage to 2018, a move that PG&E had sought to help it mitigate its exposure to the Camp Fire’s massive potential liabilities. But on Tuesday, Holden said he was withdrawing that bill, telling reporters that " PG&E has made a decision that the legislative arena is not where they feel they're going to get the kind of results that will go far enough." Who stands to be hurt most by PG&E's financial crisis? The short answer to this question is, beyond the shareholders who are wiped out, mostly PG&E ratepayers — unless the state steps in to socialize the costs. PG&E’s 2001 bankruptcy ended in 2003 with a settlement that allowed the utility to pass on about $7 billion in costs on to its customers through increased rates. How much does PG&E's coming bankruptcy cloud the utility's clean energy future? The answer to that is: a lot. Newsom said Monday that PG&E should be held to “honor promises made to energy suppliers,” including the solar and wind farms selling the utility energy under long-term power-purchase agreements. But according to Credit Suisse’s Weinstein, many of these PPAs signed in the early 2010s are selling power at prices three to five times higher than today’s renewable energy projects, making them a huge target for bankruptcy lawyers looking for money to fund all of the company’s other obligations. 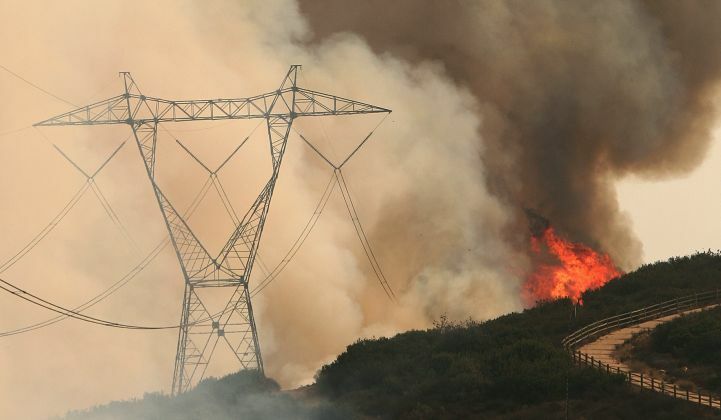 This risk has already led to significant headwinds for legacy PG&E-serving projects such as Berkshire Hathaway Energy’s 550-megawatt Topaz solar farm, which saw its credit rating cut to junk status by S&P Global last week, and NextEra Energy’s250-megawatt Genesis Solar project, which was downgraded by Fitch last month. Others at risk include Con Ed, which counts PG&E as the offtaker for about 29 percent of its renewable energy portfolio at an average price of about $197 per megawatt-hour. The YieldCo Clearway could also be in a tough spot. This lower court decision is now under appeal at the 6th Circuit U.S. Court of Appeals, and “will likely be closely watched for additional clues as PG&E moves forward with its own bankruptcy,” Rains said. In the meantime, FirstEnergy Solutions is also seeking to renegotiate a PPA signed in 2011 for 20 megawatts of solar PV at $230 per megawatt-hour, and replace it with a current-market-competitive solar PPA of $37.5 per megawatt-hour, the Credit Suisse report states. That's a preview of the kind of argument that could be made by PG&E and supporters of renegotiating its legacy PPAs to fund other creditors. PG&E's looming bankruptcy stems from wildfires sparked within the past few years. So what about future ones? How can California's largest utility prevent and respond to fires going forward? This is the question that lays bare how different PG&E’s current bankruptcy is from its 2001 bankruptcy, or in fact, most any other utility bankruptcy in recent memory. According to Credit Suisse's Michael Weinstein: “The 2001 bankruptcy was solvable through policy changes," (i.e., scrapping California’s ill-conceived energy deregulation regime and reaching a negotiated settlement between the state and various parties to return the utility to solvent ongoing operations). U.S. District Judge William Alsup, who has set a Jan. 30 hearing to decide whether to make the order a condition of PG&E's probation, noted in his order that his goal is to “reduce to zero the number of wildfires caused by PG&E in the 2019 wildfire season" — a standard that might well require a significant increase in PG&E's spending on wildfire prevention amid its bankruptcy proceeding. The judge also wrote that this zero-fires policy “will likely mean having to interrupt service during high-wind events (and possibly at other times) but that inconvenience, irritating as it will be, will pale by comparison to the death and destruction that otherwise might result from PG&E-inflicted wildfires."